« Could RealPlayer 11 encourage more DRM? During his keynote speech at Apple’s World Wide Developer (WWDC) conference held earlier this month, CEO Steve Jobs dropped a “one more thing” bombshell. The company would provide a way for third-party developers to create applications for the iPhone — not by giving access to the device’s operating system, but instead through the web. Since the iPhone runs a full web browser, Jobs said that developers would be able to build web-based applications that, with Apple’s help, would look and feel just like regular apps. This was met with disappointment among the audience gathered at the Moscone center and developers around the globe. However, ten days later, and we’ve already seen plenty of developer activity, with a number of prototype web apps being built which are designed specifically to fit the iPhone’s screen, and utilize (as much as possible) the device’s multi-touch interface. I’m calling these applications prototypes because most people have yet to get their hands on an iPhone, and only those developers who paid the entrance fee to WWDC have been privy to guidelines on what is and what isn’t possible. “We’re in a ‘wait and see’ mode at this point”, web developer David Cann, told me via email. “We don’t know much about how we can interact with the browser.” For example, how will web pages interpret a user’s finger being dragged across the screen? Will they be able to detect when a user “pinch zooms” or get access to the phone’s local hard drive in order to upload files? The answer to these questions, says Cann, could seriously hinder the possibilities of third-party iPhone applications. It’s unlikely it will be possible for third-party apps to access the iPhone’s camera and microphone, so voice and video chatting won’t be possible. 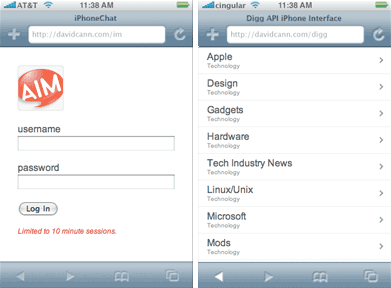 Two applications developed by David Cann to show what might be possible: an optimized version of the social news site, Digg.com, which utilizes the site’s API, and a web-based version of AOL’s Instant Messenger (AIM) which also works with Apple’s iChat. 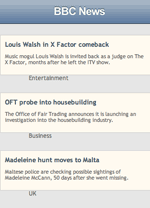 A very simple iPhone-friendly version of the BBC news, which presumably just pulls in the site’s RSS feed and re-skins it for the iPhone’s screen size. 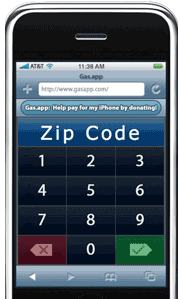 An application that enables you to look up gass prices by zip code. Currently links to the Google Maps website, but once details emerge, the developer intends to add support for iPhone’s rich version of Google Maps. A web-based RSS reader optimized for the iPhone’s interface. It works pretty nicely, though I’m guessing that the iPhone’s version of the Safari web browser will have a built in RSS reader. For more iPhone apps, check out this directory. The way the information is made availble on the iPhone’s larger tactile screen is much more intuitive than on other mobile phones, including the pricier ones. As such, the development of applications will help the iPhone gain momentum in the mobile phone market. Savvy web developers can finally build amazing apps that will follow them wherever they go (or wherever their iPhone goes, with them). Apple has the attention of everyone in the mobile phone industry, that’s for sure! There you can just type it the address to the app and see how it looks on a iPhone. I’m not saying it wouldn’t be nice or better if there was a REAL sdk for the iPhone, but a number of those things are actual “apps” insomuch as they are web apps. IM, whether it be web-based or not is still an app. If Google can retrofit any of their Docs/Spreadsheets or Calendar or whatnot for the iPhone, that’s still an app regardless of the fact that it’s on a web page. It would be nice if OS-based apps could be developed for it as well, but you shouldn’t discount things just because they’re online. LOTS of people are replacing desktop apps with web-based ones for a reason. I have an 8gb iphone: some nice added features would be voice recognition for calls, saving pictures and text (copy and paste) to the phone from the web or email, and please a voice memo recorder and video recorder. well thought out? Yes. But please, more applications and widgets!. Looking at stocks and weather becomes boring after a while. Is any of this in the works? http://itweet.net – iPhone interface for Twitter. “View New” feature only downloads new tweets to save massive loading time over the slower EDGE network! a search engine / directory for iPhone related applications that counts with the largest database of iPhone applications on the web (more than twice the size of the second largest list). Well, I personally think allowing the third party apps has more advantages then disadvantages. As anybody with the technical skills can create them without having to get the company’s permission first, it will make the I phone more open and more attractive. However there remains a doubt about the quality of the apps. I think it’s better to check out the apps before giving the permission.